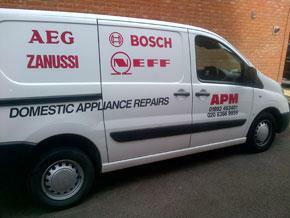 Domestic Appliance Repairs in Hoddesdon, EN11 8NW. Covering Hertfordshire, Bedfordshire, Essex, East & North London. My name is Paul, APM was established by myself in 1993. Previous to this I trained as a Bosch engineer. 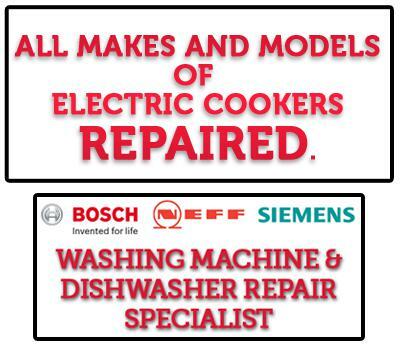 We are a family run business, specialising in Bosch, Neff and Siemens washing machine and dishwasher repairs and all makes of electric cooker and electric oven repairs. We cover Hertfordshire, Bedfordshire, Essex, East & North London. We always try, where possible, to offer a same day service, we give free estimates and free fault diagnosis. We will also beat any other (proven) quote. Most repairs can be completed on first visit, as our vans carry a huge stock and we have spare part contracts with most leading manufacturers. Phone quotations and advice are welcomed. Over the years we have had fabulous feedback and have many returning customers and recommendations. We pride ourselves on being a friendly, efficient, reliable & trustworthy company. If your appliance has broken down, we look forward to hearing from you. We offer quotes and estimates. "I phoned Paul this morning and he diagnosed the problem with my Zanussi cooker over the phone; he told me he would arrive between 1 pm - 3.00 pm and that he would phone 30 minutes beforehand. I received a phone call just after 1.00 pm and Paul arrived about 20 minutes later. 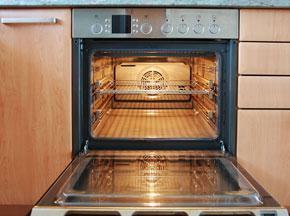 My cooker needed a new heating element and he fitted a genuine Zanussi part with a 1 year guarantee. I am very happy with the service and price and would not hesitate to use Paul again." "Arrived early due to a cancellation. Diagnosed fault almost immediately, had replacement part in the van and completed the repair quickly. Paul is friendly and efficient, would highly recommend him to anyone." "Great and efficient service from start to finish. Reasonable price, highly recommend"